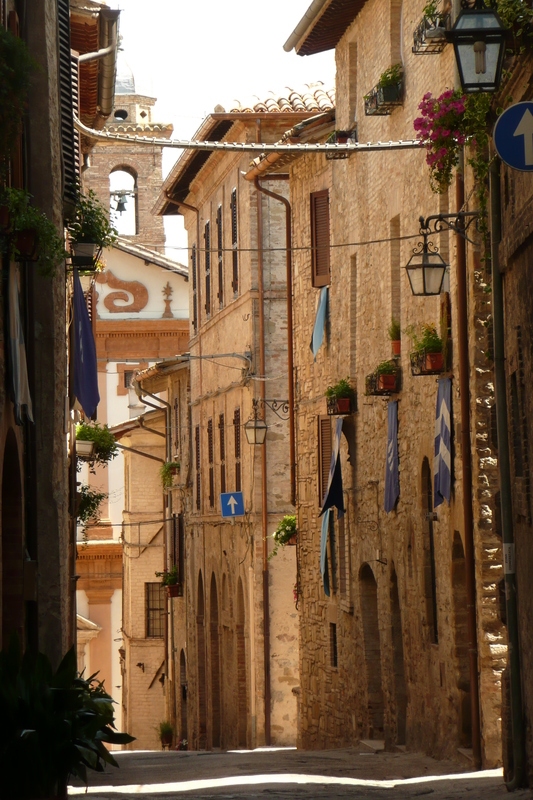 Bevagna is a small medieval town in Umbria, near Assisi, with a population of under 5,000 inhabitants. 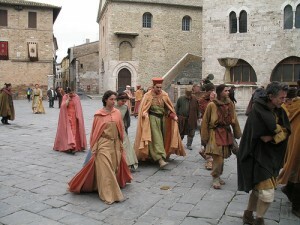 Every month of June the town re-creates its medieval past. 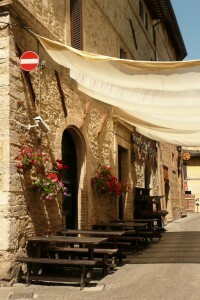 The inhabitants dress in 14th-century costume, and each quarter of the city (called the four gaite) creates a tavern which is open in the evening and serves dishes made from medieval recipes. 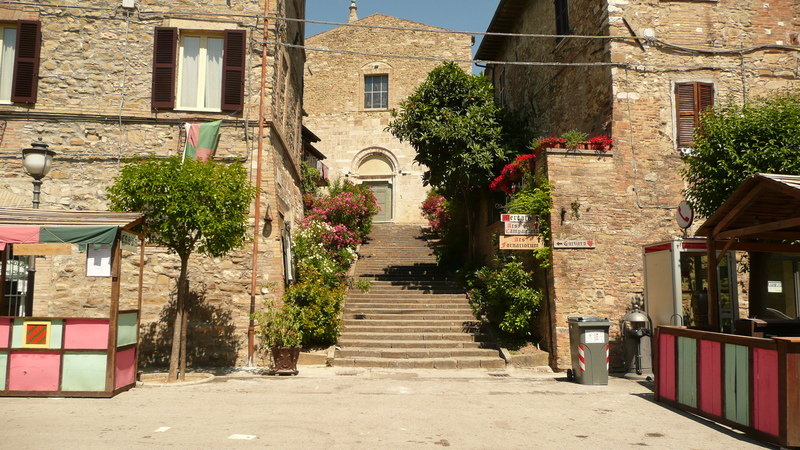 The entire set of events is called the “Mercato delle Gaite” as one of the most popular events is the large market where goods made according to 12th and 13th-century techniques are sold. The four gaite are named after saints: Santa Maria, San Giorgio, San Giovanni and San Pietro. Each quarter has its own coat of arms and own identifying colors, and all four compete intensely in various competitions. There are horse races and archery contests, processions with trumpeters and medieval banquets where the theatrical mise en scène is as important as the food. 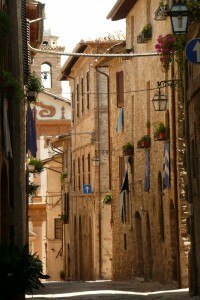 Artisan workshops are also re-created, and some – such as the coin-mint, the paper makers, the speziale (pharmacist), the monastic scribes (all university students practicing paleography) and the silk weaving process (complete from raising to worms to spinning the thread) – are often in operation all year around, providing school children with a living lesson in the skills of the past. In 2011 there was also a forge and a painter’s workshop, quite spectacular to see. The organizers are all very generous with their time and take pleasure in explaining the techniques to visitors. Can you tell me when this festival will be in 2014.? Next Bevagna Festival: 20 through 29 June 2014. It is about a 90 minute drive from Il Poggiolo – not to be missed ! !